For Car Repairs in York call us Today at Tech Tyres Ltd! Tech Tyres Ltd offers an excellent competitive service on all of our repair work, from the repairing of minor paint damage to replacing whole body panels, we are the company to call thanks to the impeccable standard of our workmanship and our affordable pricing. Paint scuffs as well as vandal damage. We can help with almost all types of bodywork damage to not only the paintwork but also the panels. So if you have been involved in an accident or wish to take care of a bodywork blemish or small chip, Tech Tyres Ltd is the perfect choice due to our high standard of craftsmanship and our level of experience. When you bring your vehicle in to us we will inspect the damage and ensure that any work required is completed quickly and that your vehicle is returned to you in the best possible condition, ready for you to drive away. 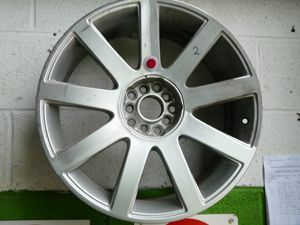 If you have suffered damage to your alloy wheels, instead of replacing them, why not bring them to us to repair? A kerbed alloy wheel can spoil the appearance or value of your vehicle, so our complete alloy wheel replacement service can restore damaged wheels to their former glory at a fraction of the cost of replacing them. Our workshop has all the tools needed to fully strip the old paint and lacquer from your wheels meaning we are not simply painting over old paint. We remove any kerb damage and prepare the stripped wheel in a sand blast cabinet so that the wheels are cleaned thoroughly before we start to apply any coatings. So if youre looking for a repair to your bumper or the removal of scuffs from your paint work just a quick call on 01904 409 795 and we can advise you on the best option for your vehicle. We are also happy to answer email questions regarding the services we offer. Drop us your questions using our email contact form and we will get back to you as soon as possible.